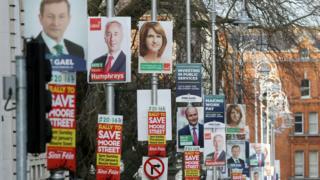 Irish election: Will voters 'keep the recovery going'? If the Irish electorate were made up solely of European leaders, international bankers and investors, Prime Minister Enda Kenny's conservative Fine Gael party would romp home in Friday's general election. Ireland has turned a corner after a catastrophic economic crash in 2008, boasting the fastest growth in the EU last year, at 6.9%. Unemployment has fallen from 15% to below 9% and the country has won praise internationally. That his government has a serious fight on its hands, with pollsters predicting a hung parliament, indicates that voters do not base their sentiments on economic data alone. Could civil war rivals Fine Gael and Fianna Fáil form coalition? Punishing austerity cuts may have balanced the books but they have hit many hard. Water charges, cuts in free healthcare for the seriously ill and education cuts for children with special needs have sparked national protests. The EU view that the Irish have taken their austerity medicine quietly may not be correct, depending on the results after Friday. Fine Gael's election slogan, 'Let's Keep The Recovery Going', might seem a positive pitch, but not to voters who say they are not feeling it. Fine Gael's main opponents, centre-right Fianna Fail and leftist Sinn Fein, argue only a minority have benefited and that the recovery has been centred around Dublin, with rural Ireland gutted of local services and police stations and post offices closed across the country. Adequate broadband is absent in many areas hindering business, and emigration has returned. Image caption Mr Kenny eventually apologised for a remark about "whingers"
Speaking at a rally on Saturday evening in his hometown of Castlebar, County Mayo, Mr Kenny's exasperation at criticism of his recovery was given full vent. "God knows we have some All-Ireland champions here in Castlebar. I don't mean Castlebar Mitchels (the local Gaelic Football team). I mean the whingers that I hear every week saying there's nothing happening." A gradual apology took two days to complete. The coastal town of Rush in rural north County Dublin is perhaps a microcosm of Ireland - with an urban-rural community and social spectrum from wealthy to poor. Many commute to work in Dublin while traditional industries like farming remain strong. A walk through the town tells the dominant themes of this election: housing, healthcare, emigration, taxes and childcare costs. A collapse in state and private house-building has sent rents and homeless numbers soaring. Emigration is at levels not seen in 30 years, while health cuts and staff shortages have led to serious overcrowding in hospitals. Despite Ireland having the EU's youngest populations, lack of investment means parents must pay up to €1150 (£900) a month for private childcare while they work. Karla Donohue (25), was an air hostess when her son Aaron was born three years ago. She's living with her parents because of this and sky-high rents for scarce accommodation: €1000 a month is typical for a small flat. "Too much homelessness, not enough jobs and taking medical cards off people with disabilities," she says, when asked for her verdict on the government. "The situation for housing is terrible: people in emergency accommodation in hotels for months. There has been some recovery but only a little I feel. "The majority of my friends are abroad. There are better jobs over in Australia and New Zealand. They're building a better life. They wouldn't have done it over here, fighting to survive on bad wages." When Irene Murphy's husband died, she had to move back to live with her mother, 27 years after she left as a young bride. "I just had to give up where I was living - the rent was just too high," she says. "Recovery? No way. There are so many people sleeping on the streets, and many people who do have houses are struggling in negative equity, like my daughter. "My son had to leave. He's over in Trinidad," she says. "The health service, however, in my experience has been good. My mother needs regular help at the moment and it's been good." Single mother Amy Balfe, who has two children, had to move back in with her parents because of the housing shortage and austerity cuts to social welfare, meaning she could no longer afford rising rents. A back injury meant she had to stop working but hopes to return to a job soon. "I've worked all my life and don't want to be reliant on social welfare". "There's a recovery - slowly but surely," she says. "We need to push to get people back to work and back working to build houses. All the plumbers, electricians and carpenters who went abroad, we want them back." Ben Connor has come back after eight years working in Prague. "For the elite there's a recovery, but it's not filtered down to the ordinary working-class people of this country," he says. "Between stealth taxes and the taxes that Irish people are suffering, the Irish people are just taking it on the chin. It's terrible. "The banks are repossessing houses from people in debt. Do they forget that the people of the Republic of Ireland helped the banks out, who are now throwing people out on the street? It's a disgrace." Emigration has hit his family too. His son had a driving school but left for Australia. "The rules and regulations for small businesses make it just impossible to operate," says Mr Connor. Paediatric nurse Sandra Sweetman set up a shop with her mother, selling clothes for mothers and babies. While her mother says the economy is improving, Sandra says trading is difficult with high business rates, a by-product of austerity cuts impacting on local authorities. "Health, education and the right to call somewhere home are the key issues in this election," she says. Those not covered by social welfare typically pay €50 for a visit to the doctor. Public health can mean lengthy waits for treatment, and health insurance is felt to be essential for those who can afford it. Overcrowding in hospitals means some patients are stuck for days in corridors on trolleys, with over 500 patients on trolleys or makeshift beds across the Republic on Tuesday this week, according the Irish Nurses and Midwives Organisation. "I lived in France," says Sandra. "They pay higher taxes but invest it and it is money well spent. We are getting there - but we must act on health and education." Farmer Enda Weldon, who has two children in Italy and Australia, has noticed an improvement in the economy but does not want to see a return to the fast growth of the Celtic Tiger years. "There's a bit more stirring, it's a bit more normal. We probably don't want to go back to the boom times anyway, a time when money had no value. Many people are still in trouble because of those times. But taxes now are very high." While most debate has focused on domestic issues, he says climate change is a worry for him too in his vegetable farming business. He's one of the few in the street not to blame politicians. "I don't think there's a lot they can do about it. It's down to people, but it's up to politicians to drive that."